Quick heads up. One of my favorite documentaries ever and it’s streaming instant on fuckflix. Highly recommend. Who needs murder and conspiracy to make a compelling mystery? Posted on Friday, June 29th, 2012 at 10:23 am and is filed under Reviews. watched it on streaming last week because of you, anderson! Here’s my review. I just finished this movie. I thought it was super entertaining. I do have mixed emotion about the end. His message of “I know my place in the world” was nice, but the reason was a little far fetched. There were several scenes where they were being a little overly sentimental about Justin, and he wasn’t looking to healthy for awhile. I was half expecting a tribute/obit to him at the end. Spoiler alert…Little disappointed he is still alive. 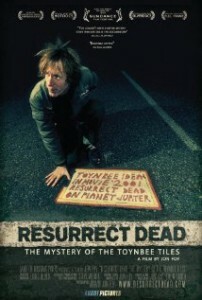 How awesome would that have been since the title is Resurrect Dead. Also, glad he is still alive. Incredibly overrated. If you hadn’t seen one of the tiles yourself I don’t think you’d have the same opinion.